Chris Brown is a Grammy Award-winning singer from Virginia who has garnered attention lately for an incident in his Los Angeles home. 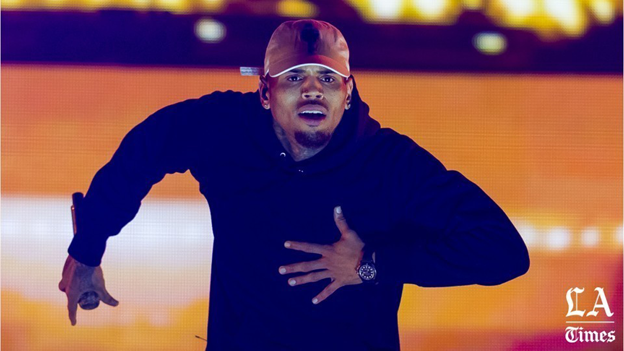 A bizarre standoff Tuesday between authorities and singer Chris Brown promised to be a “long and protracted” affair, according to an LAPD official, who said investigators had obtained a search warrant for the performer’s Tarzana home. Los Angeles Police Department Deputy Chief Bob Green said officers were waiting for Brown’s attorney, Mark Geragos. Investigators intend to search the property for a weapon that Brown is accused of using to threaten a woman early Tuesday morning. Officers had responded to a woman’s call for help at the residence in the 5000 block of Corbin Avenue about 3 a.m. Tuesday, said LAPD Officer Liliana Preciado. The woman said Brown, who has had several previous run-ins with the law, pointed a gun at her during a violent rage before she ran outside to call police, according to police sources who were not authorized to speak publicly about the case. Officers attempted to enter the home and were told to get a search warrant, the police sources said. Detectives then waited for a warrant to search Brown's home for the weapon. Meanwhile, Brown took to his Instagram account Tuesday morning, sharing videos in which he railed against police and media and said he was being unfairly portrayed as a villain. In the videos, he said he woke up to helicopters overhead and officers at his gate and said that he was innocent. Because of the high-profile nature of the case, the investigation is being handled by LAPD’s Robbery Homicide Division. Prior incidents at the residence include a home-invasion robbery and multiple complaints about Brown and his friends riding all-terrain vehicles loudly up and down the street. Brown spent six years on probation after pleading guilty to attacking his then-girlfriend Rihanna in 2009. His probation was lifted in March 2015. The Grammy-winning singer completed roughly 1,000 hours of community service. He was also ordered to attend domestic violence classes. Brown also faced charges in connection with driving without a license and accusations of a hit-and-run. In May 2014, he admitted to violating his probation after committing an assault outside a Washington, D.C., hotel. More recently, in June, Brown’s former manager, Michael Guirguis, known as “Mike G,” filed a lawsuit in Los Angeles Superior Court alleging he was attacked by the singer. Brown is said to have punched Guirguis four times in the face and neck in an incident on May 10, according to the complaint. “The assault was unprovoked and, regrettably, just another attack in Brown’s long history of violent and abusive behavior,” the complaint states.